Graham Waller, Gartner vice president, is calling on CIOs to step up to a digital business leadership role. 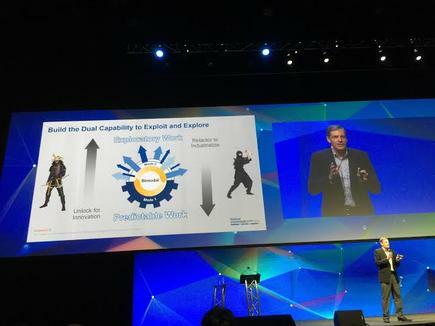 But to succeed in this role, they must also create a bimodal delivery platform, Waller told attendees at the Gartner Symposium/ITxpo in the Gold Coast. 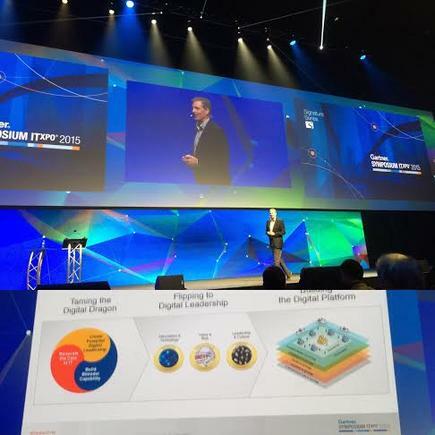 Australia and New Zealand CIOs have a tremendous opportunity in this area based on the results of the latest Gartner CIO survey, said Waller, who is also co-author of the new Gartner book Digital to the Core. The survey data showed that a higher proportion of CIOs lead digital transformation and innovation in their enterprise, but progress towards digital business in A/NZ is slower than the global average. The latest survey found that 52 per cent of A/NZ CIOs are the leaders of digital transformation in their enterprise, and more than 40 per cent are the innovation leader. This is significantly higher than the global averages of 40 and 30 per cent respectively. The survey also found that chief digital officers (CDOs) are not being put in place as fast as expected. Currently 9.1 per cent of A/NZ enterprises says they have a CDO, around the same as the global average of 9.3 per cent (up from 6.6 per cent globally two years ago). The global survey gathered data from 2,944 CIO respondents representing more than US$250 billion in CIO IT budgets in 84 countries, including 175 in A/NZ. The survey shows that the average A/NZ CIO expects digital revenue to grow from 14 per cent now to 32 per cent of total revenue in the next five years (globally, CIOs expect digital revenues to grow from 16 per cent to 37 per cent in the next five years). In the public sector, A/NZ CIOs are predicting a rise in digital processes from 38 to 79 per cent (from 42 per cent to 77 per cent globally). While the meaning of digital revenue and processes is open to interpretation, it is clear that digital business is a reality now, and it is expected to be a significant source of competitive advantage. Waller outlined the leadership tasks ahead for CIOs. "As digitalisation is intensifying, it is becoming clear that hardcoded business and operational models will not suffice and that a more adaptable approach is required," he said. "Leading businesses and government agencies are looking less like fixed ‘systems’ and more like platforms. “A platform provides the business with a foundation where resources can come together — with the ability to rapidly configure groups of assets both across the business and the broader ecosystem — to create value." Platform thinking is a horizontal view, a way to rapidly convene resources to create new value in a much more flexible way both inside and outside the enterprises, he explained. These include serving customers in new ways, create new business modes and tap into ‘economics of connections’, a reference to the value that can be gained from the Internet of Things. In his presentation, Waller highlighted the key pillars of a bimodal delivery platform. A metaphor for this approach is the samurai and ninja, he said. The samurai acted in a strict code of conduct. But in other areas, the more flexible Ninja approach was used. Waller said at the 2014 Symposium, Gartner reported that it is essential to have two modes of IT, and ultimately of the entire business, to deal with both predictable and exploratory work. Two years later, the 2016 CIO survey found that almost 40 per cent of CIOs are on the bimodal journey, with the majority of the remainder planning to follow in the next three years. When asked to choose whether security and cyber risk or new competitive and commercial threats posed a greater threat to their business, 66 per cent of ANZ CIOs chose security and cyber risk (compared to 54 per cent in the overall global survey). On the competition front, ANZ CIOs are equally concerned about digitally driven competition from traditional industry competitors (50 per cent) and digital-enabled companies entering their industry from other industries (50 per cent). According to the survey, 49 per cent of ANZ CIOs believe there is a talent crisis, and yet there is surprisingly little talent innovation. "It is time to think of talent as a platform and innovate with it," said Waller. “CIOs must look at digital talent beyond the boundaries of the IT organisation, and indeed beyond the boundaries of the enterprise. "Innovative talent management opportunities abound and include getting closer to universities by helping define and deliver courses and projects, performing reverse mentoring and implementing job rotations. CIOs should also think of their partners as extensions of the talent pool." CIOs globally and in A/NZ identified the biggest talent gap in information and analytics skills. However, in A/NZ the next two biggest skills gaps are project management and architecture skills, while globally, CIOs cited business acumen and security as the biggest skills gaps. The top areas of new technology investments clearly show that significant spending and opportunity continues in big data and analytics, and that cloud continues to have significant momentum. “As has always been the case with business intelligence, the key to big data is to point it at opportunities to harvest real business value from insight. The opportunity is to monetise big data, underpinned by the cloud,” he said. As well, the Gartner survey showed that the purse strings are loosening, "but only a little," said Waller. Australian and New Zealand CIOs expect an average budget increase of 2.9 per cent, slightly higher than the global weighted average of 2.2 per cent and an improvement over last year’s expected slight decline in A/NZ of 0.2 per cent. However, they cited money as their biggest barrier to achieving their objectives as a CIO, while globally, skills are seen as the top barrier.